If there is one thing I love to do, it is to spoil myself when it’s time to recover. Massages, stim, and foam rolling are the typical products, but there are so many more incredible products out there for you to try. But for all intensive purposes, I am going to provide you with the best products to recover with that you may have never heard of or were considering purchasing but needed that recommendation from an outside source. The Stick is a great product that comes in many different sizes and options for recovery. The Stick is a handheld device that can help roll out your muscles and the pressure is based upon how hard or light to press the device into your muscles. I am a fan of the Stiff Stick in the travel size because it’s easier use and get in all different spots on your body. Plus it’s great to travel with! What I love about this product is that you can throw it in the freezer and receive a nice cold burst while massaging your feet. Why? 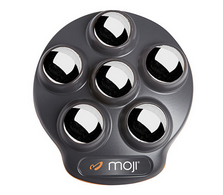 The Moji Foot Pro is made of stainless steel to allow for freezing. There are 6 rotating spheres to hit your foot in different places whether it is your arch, heel or forefoot. The pressure the balls emit is why I love Moji because not only do you get a massage, but a deep tissue one to roll out the kinks and soreness and bring you the relief you need. The fact that it stays in place thanks to its gripping also provides enough stability to allow me to use it on my upper back which can be a hard place to reach. This is a great tool to travel with as well as it is small enough to fit anywhere in your bag. Foam rollers are some of the best things ever invented for runners and this one is no joke. The GridX provides great relief and is wonderful when rolling out my IT bands, tight hamstrings and sore quads. With the GridX, you lay on it and it just provides more pressure than the original Grid foam roller. It’s twice as firm and helps promote the flow of blood and oxygen. It is also small enough to travel with it. The Marc Pro Plus is an electronic muscle conditioning system that stimulates the muscle in order to improve and facilitate muscle performance. The device sends through the muscles a series of strong, non-fatiguing contractions, ultimately improving the capacity of your vascular system helping you to recover faster and reduce muscle soreness and fatigue. I am a big fan of this product because it also provides a pain relief option for those who have experienced lingering pain that doesn’t go away. It won’t help get rid of the pain, but it well help in the meantime. I love to stim because it really does help the muscles recover faster and help the legs feel lighter. There is a less expensive option in the Marc Pro but I find them to be worth the price because if you are spending money on massages and other tools, this one should be part of your recovery routine. If there is one product I fell in love with the minute I finished the recovery cycle, its NormaTec boots. These recovery boots are like a massage but strictly for your legs. The boots go through a 3-step process called Sequential Pulse Technology throughout every zone of the boot. The pulsing, gradients and distal release is what helps speed up the body’s recovery process by squeezing the fluid out of the legs using dynamic compression that is holds the pressure in each zone to prevent the fluid from going to the feet. Thanks to the process, it deliver maximum pressure to the entire leg and then releasing the pressure once it is no longer needed. How do you know its working? You can feel your pulse in your legs and then once you are done, your legs feel incredibly lighter. NormaTec is a bit pricey, but they do offer discounts throughout the year as they are doing now. These boots are very helpful especially immediately after a race to help with recovery.